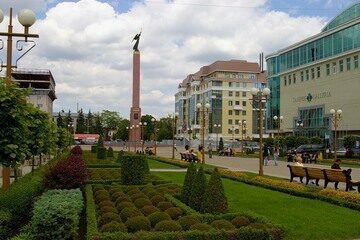 Stavropol is the administrative center of Stavropol Krai, besides it is a cultural, business and industrial city of the krai. It was founded in 1777. The population of Stavropol Krai is 2 735 139. Stavropol is the southern city. The shortest day here is 22 December, which lasts 8 hours 44 minutes, while the longest day 22 June lasts 15 hours 37 minutes. The city is known for frequent winds with a speed of 35-40 metres per second. The most windy months of the year are February and March. Stavropol experiences a humid continental climate with short but cold winters (though mild for Russia) and hot summers. Precipitation is rather low, with a 571 mm annual average. The hottest month is July with the average temperature of +22,4 °C. The average temperature in winter is -5,1 °C. There are 18 institutes of higher education,functioning in the city at present time.